Oracle Reports is a comprehensive reporting tool for enterprise wide reporting, information delivery, analysis and decision-making. But you will find it is difficult to generate spreadsheet output from oracle reports. We introduce an easy, low cost way to output rich format excel report. Rep2excel is a win32 application, It can convert the HTML output of oracle reports (6i, 9i, 10g) to excel spreadsheet. Rep2excel can convert report not only in HTML but also in HTMLCSS format to excel format. It is excel report generator for Oracle Reports. Generate report output to spreadsheet format from existing paper layout reports. Preserve the rich layout formatting such as colors, fonts, conditional formatting, graphs, and images. Rich format excel report. What you see in html what you get in excel! Lost cost.Rep2excel enhance your report server to output excel. protect your IT investment. Less coding even no coding. The Rep2excel is developed for Oracle Report only. Deploy Rep2excel as a CGI application, call it from web. Use command line to call rep2excel. 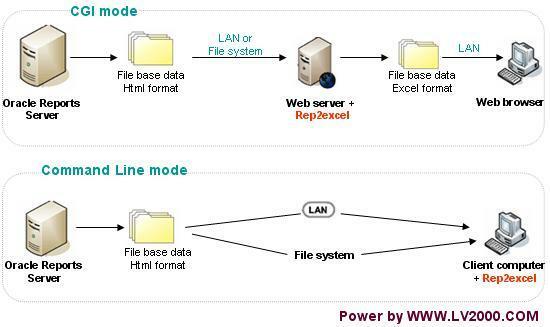 Output to file system, save as an .xls file. Please click here to download an sample code demonstrates how to call rep2excel from oracle forms. Install a web server such as Apache ( Oracle http server is based on Apache ). Copy rep2excel.exe to the directory %APACHE_HOME%\cgi-bin\ .Invoke the program by URL http://your-server-name:port/cgi-bin/rep2excel.exe .the software runs, a web page will appear. Now , What you need is inside web-browser ! FAQ: My report server is running on Unix, how can I do to use Rep2excel. Install rep2excel and MS Office on a windows server. Invoke rep2excel and specify filepath=URL. (rep2excel can download files from another server). The free trial usage period of Rep2excel is 30 days. If you would like to use this software after the 30 days evaluation period; a registration is required. You can order the fully licensed version of Rep2excel over the Internet with any major credit card. Please click here for more inforamtion. Purchase Rep2excel online through a secure server with any major credit cards. ©2003-2014 Lion Soft Ltd. All Rights Reserved.